Dave Morris Retires After 20 Years! Dave Morris (Lead Drafter-Bristol) was recognized on August 23rd, in honor of his retirement from Strongwell. Dave was with Strongwell for twenty years. He began his career as a structural detailer where he later became a structural detailer/checker. His retirement plan consists of frequently traveling to see his family in Raleigh, North Carolina, as well as biking, fishing, volunteering and discovering the western portion of the country. 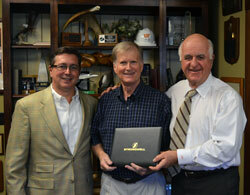 Strongwell congratulates and thanks Dave for his hard work and dedication over the years.